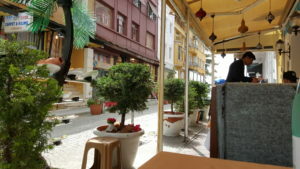 Originally, I was supposed to catch a 10:30 am flight from Rome to Istanbul, but due to the lack of people wanting to risk a visit to Istanbul in the wake of the spring bombings, that flight was canceled and I was shuffled over to a 7 am flight. Which sucked, in one respect. 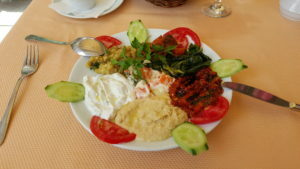 However, I got to Istanbul before lunch, and was able to have a nice lunch before hitting the sights. Sitting outside and enjoying the afternoon. Still playing catch-up on the blog. Today we have pictures from my visit to The Vatican. And no, I didn’t meet the Pope. Apparently that’s on Wednesdays, and frankly, I was on a schedule. My apartment in Rome was just south of the Vatican, and I could hear the church bells when I sat out on the balcony, even though I didn’t have an astonishing view as in Florence. But the train station that was merely steps from my building was the closest to it, so any time I ended up in the station, there were nuns, priests, and monks thick on the ground. Hello all! I’ve fallen behind on the blogging, but just because I was having so much fun! I promised better pictures than those from my phone, so we’ll start off with the beauty of Florence. Warning: Image Heavy. REALLY image heavy. Technically, I know that I’ve only been going since 8 am (it’s 9:45pm as I write this), but it feels like a week’s worth of things got packed into one extremely long day. In which Geek Magnolia sets off in search of herself. Hello again Geeks! It’s been a weird 2016 so far, what with the layoffs and such. I’m still trying to figure out my next step in life, and as stressful as it is, it is in a way, liberating. Yes, I have to watch my money, and searching for a job is no fun, but I also have a little bit of freedom to figure out what I want to be, and how I want to approach life. I won’t say that I’ve been depressed, because I’ve seen depression, and I don’t think my struggles have been that hard. But I have been down, waffling between hope and exhaustion. In order to kick-start my mood and tell myself life will still be good, I decided to indulge in my favorite thing ever, travel. Thanks to Turkish Airways, I was able to get a round trip ticket to Italy for a steal. 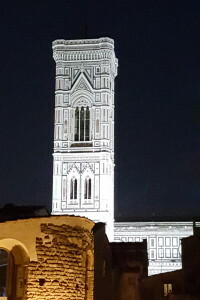 So tonight, I’m sitting in my AirBnB apartment in Florence, looking out my window at the bell tower of Cattedrale di Santa Maria del Fiore (Il Duomo), and blogging about my adventures. Pretty okay, right?